"Volume 15 includes teachings from the last two of the eight lineages of accomplishment: that of Vajra Yoga (also known as the Six Branches of Union, or Jordruk) and Dorje Sumgyi Nyendrup (Stages of Approach and Accomplishment of the Three Vajras). The former is a system of advanced tantric practices based on the teachings of the Kālacakra tantra, particularly as transmitted through the Jonang tradition of Tibet. Though ostensibly a tantra of the Sarma tradition, the Kālacakra was also highly esteemed in the Nyingma school. 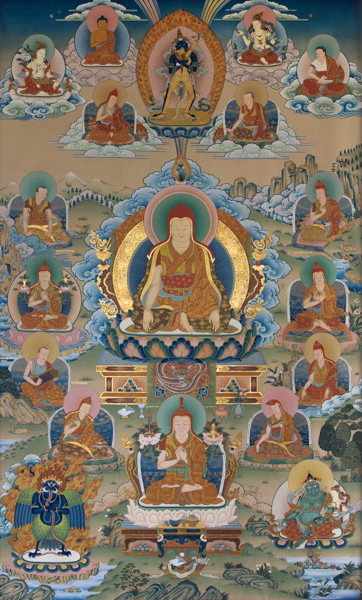 The great Nyingma master Jamgön Ju Mipam Gyatso (1846–1912) wrote a two-volume commentary on the Kālacakra cycle and considered the teachings of this tradition to reflect those found in the Dzogchen approach of the Nyingma. The section dealing with the seventh system, that of the profound path of Vajra Yoga, includes the primary source—the quintessential Kalachakra Tantra—as well as instructions from the intimate oral lineage of Kalachakrapada and some small source texts by Shavaripa. There is the sadhana and offering ritual for the nine deity mandala, the extraordinary sublime empowerment and its instruction manuals and auxiliary texts, all authored by Jonang Jetsün Rinpoché. The section includes The Profound Path: The Sphere of Nectar; the middle-length treatment of the Six Branches of Union from the tradition of Anupamarakshita; and the concise version entitled Touching the Tip of the Tongue to the Palate. There is a ritual to honor the gurus of the tradition of the Six Branches of Union, as well as the authorizations for the form of Kalachakra with consort and the protective deity Vajravega. The section dealing with the eighth system, that of The Stages of Approach and Accomplishment for the Three Vajras, includes the primary source (which was bestowed on the mahasiddha Orgyenpa by Vajravarahi and the dakinis of the four families). There is also the explanatory commentary to this, as well as the instruction manuals and the methods for meditating to bring the stages of approach and accomplishment to consummation in a single sitting. Source: Richard Barron, The Catalog of the Treasury of Precious Instructions, pp. xxi-xxii. ↑ Elsewhere Kongtrul cites the first two lines of this passage as being from a source he identifies as the Discourse Requested by the Child of the Gods (Lha’i bus zhus pa’i mdo). Jamgon Kongtrul, The Treasury of Knowledge, Books 2, 3, and 4: Buddhism’s Journey to Tibet, trans. Ngawang Zangpo (Ithaca, NY: Snow Lion Publications, 2010), p. 122. This page was last edited on 28 January 2019, at 21:48.